As you can see, it shows Jesus smiling on the cross—a very odd concept, I must say, especially when set next to big red letters that read “JESUS SUFFERED.” Now, I know that whenever kids draw people, smiley faces are their default, so I’m not necessarily attributing profound insight to little Abi. But in light of Hebrews 12:2—“For the joy set before him he endured the cross, scorning its shame, and sat down at the right hand of the throne of God”—the depiction is very apt. Whether he actually smiled or not doesn’t matter as much as the fact that he had a deep-seated joy in glorifying the Father, so in a way, he was glad to die, since it meant saving mankind from sin and death and bringing them into perfect and everlasting fellowship with God. As odd as it sounds, Jesus was happy to bear our sins to Calvary, to absorb the wrath of God, and to suffer and die in our place. He loves us that much. And it makes him even happier when we acknowledge his sacrifice and claim the gifts it wrought—salvation, life, forgiveness, freedom, power, etc.—as our own, through him. 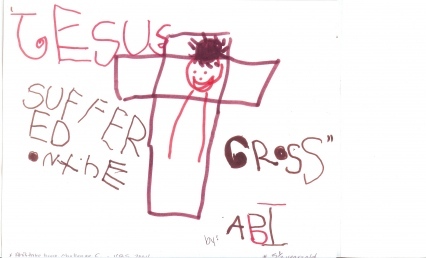 This child’s drawing made me wonder whether there are any precedents of a smiling crucifix in art history. I could find only this one. Jesus experienced unimaginable horrors on the cross. Do you think he could have smiled while he was up there? And if so, what is it that made him smile, exactly? 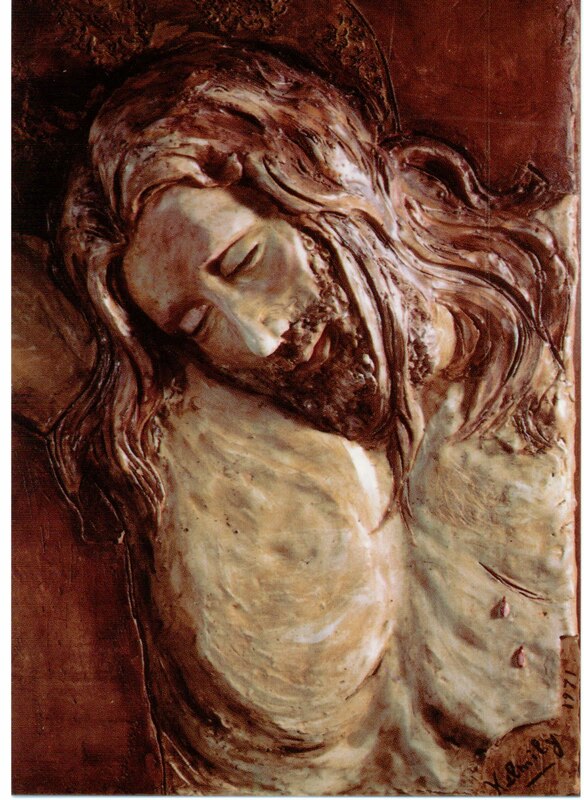 Have you ever seen any serious artistic depictions of Jesus smiling on the cross? 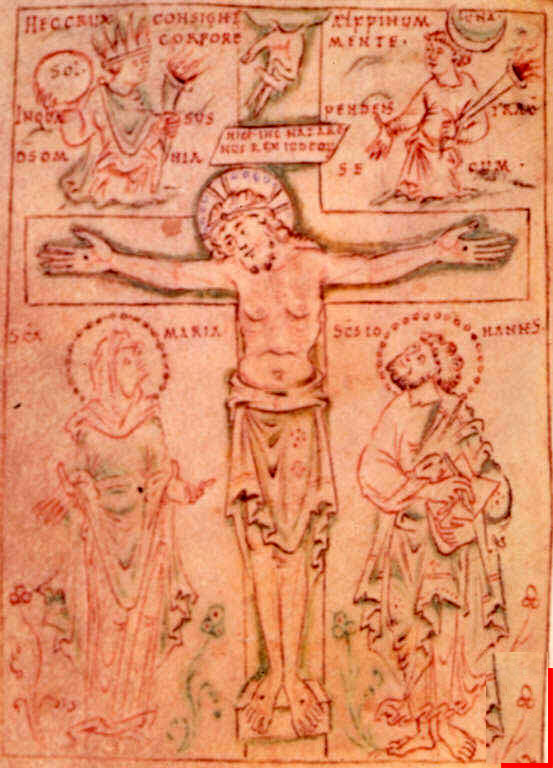 "Christ alive on the Cross, with the Virgin, and St. John writing his testament," from the Prayerbook of Aelfwine, c. 1023-35. Source: British Library. 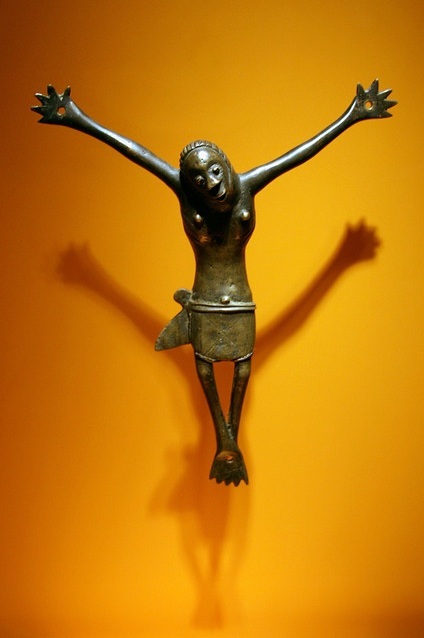 "Crucifix," 17th c. Copper alloy. Congo. 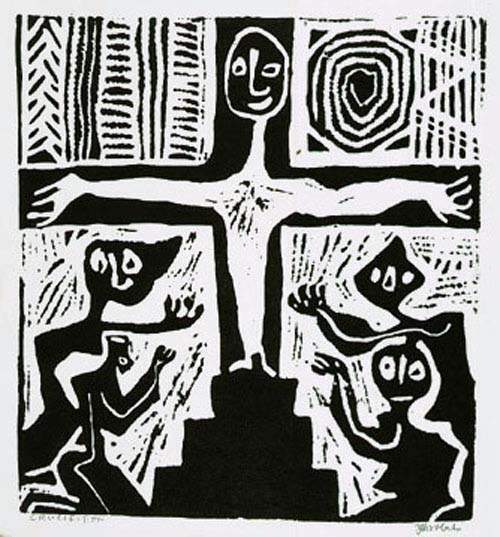 On display at the National Museum of African Art, Washington, D.C.
Jacob Afolabi, "The Ecstatic Crucifixion," 1990s. Linocut on paper. Oshogbo, Nigeria. This entry was posted in Theology and tagged smiling jesus. Bookmark the permalink.